Learning that your child has cerebral palsy is not the news that parents want to hear, especially when you probably have a myriad of questions and concerns. What life for a baby or child with cerebral palsy will be like may be one of those questions. Although adjustments will have to be made, you can learn to enjoy life with your child despite limitations by being aware beforehand of what to expect. Living with cerebral palsy also in your family also means making sure that your child gets everything she needs to live her best life. That means being aware of your child’s vulnerability to abuse and bullying, thinking about inclusion in school, providing the adaptive equipment that will improve her mobility, and considering her transition to adulthood and greater independence, along with many more issues. Cerebral palsy most commonly affects movement. The degree to which a child’s movement is impacted varies by individual, but there are likely to always be some kind of issue with mobility, moving, motor skills, and getting around. Early on it is important to start thinking about mobility issues and how you will help your child move as easily and freely as possible, with pain and discomfort minimized. 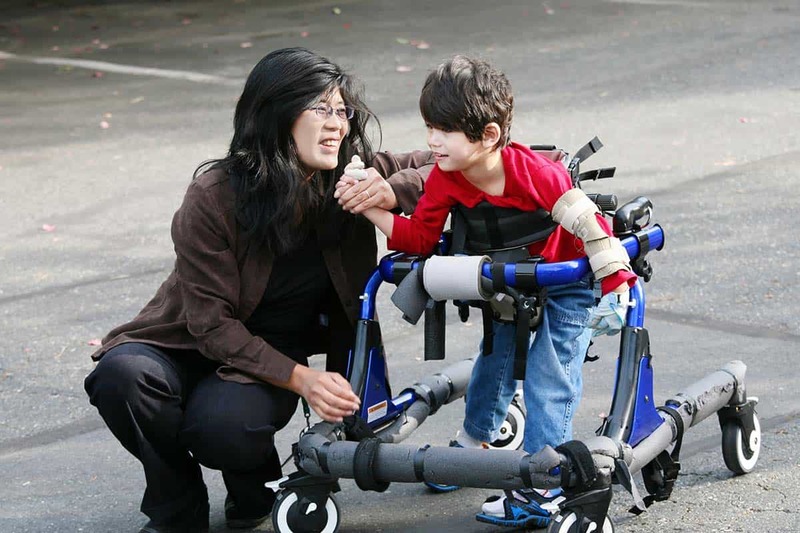 Mobility is a part of cerebral palsy evaluation and care that requires one or more types of doctors, but especially an orthopedist, a doctor that specializes in the musculoskeletal system. Make sure you have an orthopedist on your child’s medical team. Early evaluations and treatments, which mean include physical therapy, medications, or even surgery, can help your child gain better mobility and movements right away. As your child grows, more mobility issues will become clear and you can start to plan better strategies for dealing with them. This may mean procuring a wheelchair or other assistive devices, like walkers, canes, and devices to help with hygiene and eating. Look to your health insurance, community organizations, charitable organizations, and government funding to help you pay for the devices your child needs to be as mobile as possible. Daily living can be interrupted when a child with cerebral palsy has trouble communicating his/her needs and wants. Communication problems are among the leading issues that parents of children with cerebral palsy have. However, you can make things a lot less difficult with patience, coupled with the proper treatment plan. Keep in mind that not all children with cerebral palsy will have problems with communication. However, speech therapy, conducted by a licensed speech pathologist, is still recommended for all children with cerebral palsy to help any problems down the road. Some children with cerebral palsy aren’t able to talk at all. In these instances, using assistive equipment such as communication boards with pictures, letters, and words can help make communication easier. Other options can include tablets and/or Augmentative and Alternative Communication (AAC). Some children with cerebral palsy will need full assistance when it comes to meal and snacks, including those who have limited mobility or the inability to grasp objects. Along with preparing meals and snacks, you’ll need to assist a child with limited mobility in eating and drinking. A speech pathologist can assist you in learning the best techniques when assisting your child during meal time. In addition, a child with cerebral palsy may need specially-prepared meals to meet their unique diet needs. It can be a challenge making different meals for your child as opposed to the rest of the family, but since children with cerebral need a high-quality diet with lots of vegetables and other healthy foods, this could be an ideal way to create a healthy diet for the entire family. For most people, sleeping is simply something they do, but for a disabled child with pain and movement issues, sleeping can be a major challenge. To help your child be successful in all areas of life, good quality sleep in the right quantities is crucial. It is important for every child but may be more difficult for your child to achieve. Your medical team can help you if your child struggles to sleep. Some important things to do include making sure your child gets exercise, even if her movement is limited, ensure she eats a healthful diet, and create a calming bedtime routine. Most important, though, may be ensuring that your child is comfortable in bed. This is a major issue for many kids with cerebral palsy because they experience pain from issues with their muscles and being unable to move in ways that make them more comfortable. Work with a physical therapist to find the sleep position that is best for your child. Daily living activities consist of using the bathroom, bathing, getting dressed, brushing teeth, washing hands, and other forms of hygiene that take place on a daily basis. Young children will need help with all of these activities, but children with cerebral may need long-term help, depending on how severe the disorder is. Encourage your child to learn how to dress alone by teaching him/her how to lay on his/her side while putting clothes on, sitting against a wall, or holding onto something sturdy. The same thing applies to bathing and using the bathroom. Once your child can sit up alone, make sure that they always have something sturdy to grasp while bathing and using the toilet. Consider getting non-slip pads for your child’s bathtub. Always encourage your child to brush his/her own teeth and bath themselves. If they are not physically able, you’ll need to assist them daily, but you can make the activity fun by turning it into a game until they are old enough to understand the importance of daily hygiene habits. Playtime is extremely important for children with cerebral palsy, and should always be incorporated into their daily living schedule. Remember that your baby may have a disability, but is still a baby that craves new experiences and the chance to learn through play. That kind of play may look different from what you expected based on the severity of your child’s limitations, but it will still be play and it will still be an important part of her development. Play activities will depend on your child’s age and how severe his/her cerebral palsy is. For instance, some children with cerebral palsy can learn to toss a ball back and forth, whereas those with limited mobility will benefit from other types of activities. Your child’s physical therapist can work with you to set up a play schedule that would best benefit your child according to their individual physical and mental needs. Learning at home is beneficial to all children, but if your child with cerebral palsy has cognitive disabilities, home education along with specialized education can help give them a needed boost. The earlier that interventions are used for any child, the greater positive effect they will have, so start thinking right away about the kinds of strategies you can use at home to help your child learn. Communication and daily living skills are some of the most important issues to work on during daily learning. Constant practice and reassurance will your child become more self-sufficient and independent. Practicing letters, words, and images on communication boards (if needed), as well as reading stories on a daily basis will help your child not only learn to communicate better, but to expand their imagination. Children with cerebral palsy are more likely to be excluded from activities and educational opportunities. Inclusion is important because it will help your child develop in such a way that she becomes comfortable socializing, speaking up for herself, and simply feeling like an ordinary child, just like everybody else. Parents often have to fight for inclusion. Any child with a disability should have an Individualized Education Plan, or IEP, which is created by a team of professionals through your school’s special education department. The IEP will direct your child’s education and any special interventions or accommodations she needs. While planning the IEP, push for inclusion in general education as much as possible for your child. This isn’t something that most parents want to think about, but the truth is that disabled children are more likely to be abused and bullied than non-disabled children. Abuse is most likely to come from a caregiver or other adult that spends a lot of time with a child. Parents and caregivers must be aware of the signs of abuse and intervene if necessary. A major, important sign of abuse is any change in behavior in a child that seems unusual or that cannot be explained. At school and in other social settings a child with cerebral palsy is at risk for bullying. Bullies target children they perceive as being different or as being powerless. A child with cerebral palsy is likely to look different and may have trouble communicating to others, which takes away her power to fight back or to tell someone what is happening. All children and teens will go through some road bumps on the way to becoming adults, but for a disabled child, this transition is even more fraught with risks and difficulties. Begin early on to help your child learn to be independent. Let her do things for herself, so she can gain the skills and the confidence needed to make this transition. For those with cerebral palsy who have disabilities that are not severe enough to prevent them from becoming working, independent adults, there are many options for life after high school and life after living at home. A child with a normal or above average intelligence can make the transition to college, although she will need to find a school that feels right and that offers the services and accommodations she needs. Other children with cerebral palsy may be more interested in a vocational education. Job training can be a great way to transition to adulthood and to work toward independence. There are vocational schools and even colleges that provide training for young adults with intellectual disabilities. In addition to job training, these programs teach life skills, social skills, and help place young people in jobs. Training programs are useful, but parents also have a responsibility to help disabled children learn the kinds of life skills that will increase their chances of being successfully independent. An important aspect of living with cerebral palsy in the family is the costs. Disabilities are expensive and it is crucial that families start thinking about costs immediately so that they can ensure their child gets the best care. Healthcare, surgical procedures, medications, adaptive devices, specialized educational services, physical therapy, and then later, vocational training and other services will cost a lot during a child’s life. Ways to cover the costs include health insurance, Medicaid if a family qualifies, government funding from programs that support individuals and families with disabilities, community-based organizations, and charity organizations that help families with disabled children. Living with cerebral palsy presents many more challenges than living without a disability, especially if the complications are severe. It can be a big burden on a family to care for a disabled child, but with good planning, routines, good medical care, and resources and support, a family can provide a great life for a child with cerebral palsy. Remember, if you ever need help adjusting or creating a living schedule that works for you and your child, there are numerous physical therapists, speech therapists, behavioral therapists, counselors, and pediatricians that can help you. Contact your child’s primary medical caregiver if you need referrals or resources.